The next part of the Rushaan pattern is where all the action happens! We join the Body and Sleeves into a single big piece on a long circular needle, and then work the Upper Body, seamlessly shaping the sleeve caps and shoulders. Starting at the center front, you'll work across the right front Body stitches, the Right Sleeve, the back of the Body, the Left Sleeve, then the left front Body stitches. The stitches you held on waste yarn for the underarm will line up at the Body and Sleeve pieces, and you'll graft them together with Kitchener stitch once you've finished working the Upper Body. How the joining row works. The stitches held on waste yarn line up at the underarms. Once the body and sleeves are joined, we'll use decreases to shape the back, fronts, shoulders, and sleeves in one seamless piece. If you were knitting a seamed sweater with set-in sleeves, you'd work a sleeve cap by binding off a handful of stitches at each edge of the sleeve, then completing the sleeve cap in a bell shape. We're going to do much of the same shaping, but seamlessly. The lower part of our sleeve cap is shaped like a set-in sleeve cap, but instead of binding off stitches, we've got them held on waste yarn to be grafted together later. And where the front and back pieces meet, instead of a shoulder seam, there's a wide saddle with the garter-stitch panel in the center. Decreases Sleeve stitches on every other row to gradually shape the lower part of the sleeve cap. Decreases Sleeve stitches on every row to more dramatically shape the upper sleeve cap. Decreases Body stitches on every row to shape the upper body. Working just the saddle stitches, one side at a time, joins the saddle stitches to the front and back, using decreases that consume Body stitches. The Upper Body shaping on Rushaan. Note that, while you're working Step 3 (shaping the upper back and fronts with body decreases), you'll also shape the front neck. The whole neckline looks a bit raggedy here, but the buttonbands and neck finishing cleans it up beautifully. We'll talk about finishing in the next and final installment of the knitalong! Once you’ve chosen yarn for your Rushaan, the Handsome introduction has all the information you’ll need to choose a size and select your custom options. Because the Rushaan sweater is so simple in design, there are loads of options for customizing its size and shape. You can adjust the body length and sleeve length, add body shaping (A-line, V-line, or X-line), and/or work a short-row belly. For my Rushaan, I chose a size with about 2” / 4cm positive ease. I’ll be using the custom body length, sleeve length, and X-line shaping calculators. Remember that, if you use custom calculators that make your Rushaan longer or larger than the pattern version, you may need more yarn than the pattern estimate. Make sure you have enough yarn! The body of the sweater is worked as a seamless tube. 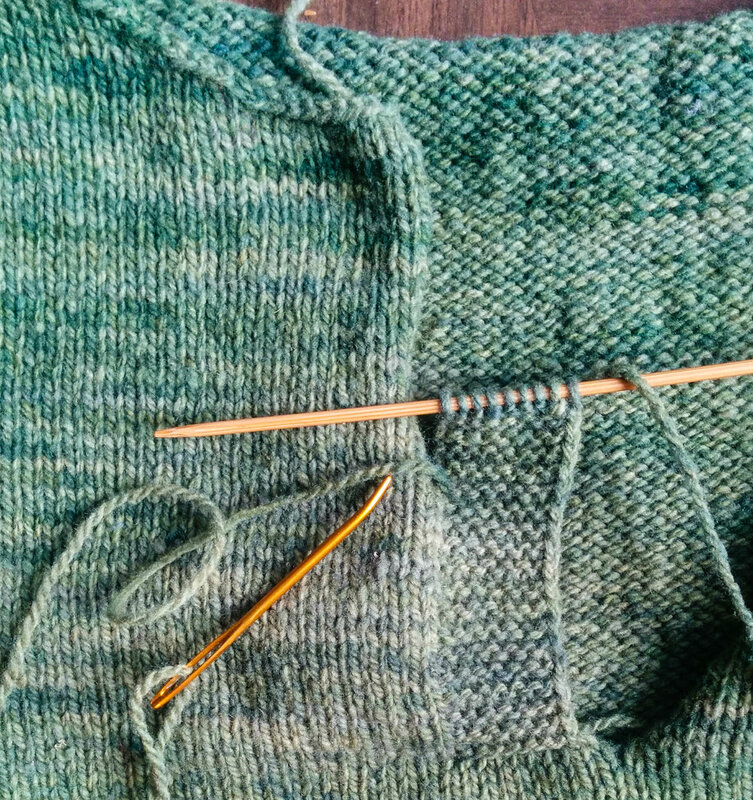 This means that if you add body shaping, your increases and decreases will be done at the beginning/end and halfway point of the round — where side seams would be, if the sweater had seams. Of course, it also means that, if you’re working a short-row belly, it’s done on the front half of the stitches only. The alternating/alternate cable cast-on called for in the pattern is a simple, flexible cast-on that works nicely for 1x1 rib. The cast-on stitches blend right into the rib, instead of creating a solid cast-on edge. I used this cast-on for my Rushaan, and it looks smashing (if still unblocked and kind of rumply). Once your cast-on is complete, you’ll work the ribbed bottom band, and then begin the body of your sweater, working any body shaping from the custom calculator. And once you reach the underarms, you’ll set the body piece aside while you knit the Sleeves. The Sleeves are worked just as the body is, except that the increases for shaping the sleeve happen only at the beginning and end of a round. Next up, we'll JOIN the Body and the Sleeves in one giant mess of a sweater monster, to finish the upper body in a single seamless piece.